A riveting piece of filmmaking that won the 2008 Jury Prize at Sundance. A hunter on the frozen Arctic becomes witness to a crime. I’ve expressed this before, but I do feel legitimately sheepish when picking out for the site a short film such as Sikumi (On the Ice) that has enjoyed a high profile. Getting into the YouTube Screening Room after winning the top prize at Sundance truly is near the upper limit of exposure a short can garner (only thing left is being featured on SotW =P). This hesitancy I suppose stems from wanting to surprise you who are short film fans and already know about the big releases, as well as a desire to do the righteous work of shining a light on deserving filmmakers in obscurity. However, while exposing undiscovered gems is the implicit promise of the internet and an explicit promise of this site, there are a lot of people who aren’t short film fans per se. If that’s you, we also want to make it a point to do service in recognizing those short films that are simply, jaw-droppingly great. Sikumi, we’re looking at you. Filmed outside Barrow, Alaska, this short takes place on the beautiful yet terrible Arctic ice amongst the Inupiat peoples. The film’s dialogue is spoken in their language. A hunter, together with his pack of dogs, sees two men fighting on the barren horizon. From that point the film becomes a tense morality play, as the bystander must decide his level of engagement, and the participants must decide on the level of escalation. Further explication would spoil this simple, yet riveting story. The challenge for a film like Sikumi (On the Ice), is overcoming its exotic location and culture—the same features that serve as an asset to lesser films. It is easy to dismiss shorts such as these by charging that their, admittedly alluring, foreigness is the primary source of appeal. Sikumi rises above such perceptions via superior craft, and a plot that is ultimately universal. Rising star Cary Fukunaga served as DP on the project. His feature length directorial effort Sin Nombre, made many top 10 lists this past year, and he has now lined up a Hollywood adaptation of Jane Eyre for himself. While the vast white expanse of the arctic is an admittedly attractive backdrop, You have not seen it with this level of intimacy before. Planet Earth this is not. Fukunaga employs beautiful close ups and hand held POV’s to complement the obvious panoramas, shooting in anamorphic 35mm. All this while dealing with the challenging sub-zero Alaskan “summer”. Writer/director Andrew Okpeaha MacLean though does great work in providing the story and tone for Fukunaga to visually relate. A Barrow native, MacLean writes what he knows, but is also writing within a long filmmaking tradition. Sikumi you see is really a Western. The frontier has not been tamed it has simply moved. Westerns are often about competing moralities, tensions between personal codes. The weight of personal responsibility in these instances is heightened and rendered in sharp relief by the absence of societal enforcement. Typical protections afforded by Hobbesian bargains do not apply. 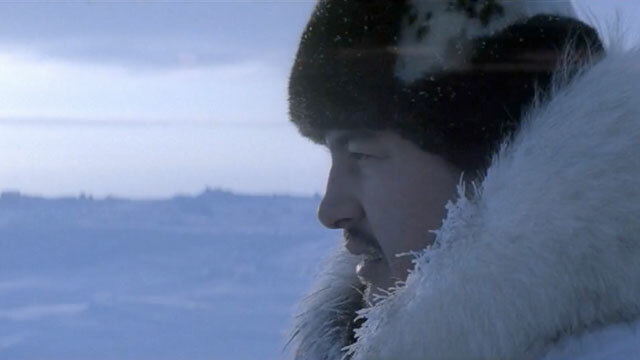 It is within this space—the frontier of the ice, that the entirety of the film resides, and thus Sikumi is alternately suspenseful, scary, yet humanistic. The hunter with whom we arrive upon the scene with speaks very little, he is almost a non-character, as the onus of action quickly shifts to the perpetrator. Instead he serves as a stand-in for larger concepts such as Community, which judges and sets standards of conduct for a people , and Conscience, which, even in the absence of witnesses, must live with itself. A startling spare and beautiful update on the Western, Sikumi (On the Ice) takes full advantage of the stark and dramatic setting it employs, yet nonetheless could have been effectively told anywhere using anyone. Thus it transcends novelty on the way to becoming one of the best shorts of recent memory.